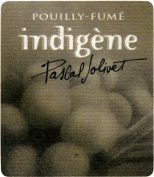 Terroir: Pascal Jolivet Indigène is assembled from a range of Pouilly terroirs. The wine is powerful and taut, with a pronounced minerality that complements strong flavored cuisine, and develops layered complexity and weight with aeration. Aged for 12 months on its lees and bottled unfiltered, this is enjoyable now, and will age well. This bottling is the quintessence of Pouilly Fume: very rich, very deep, brooding and age-worthy. This powerful and full-bodied wine offers minerality, finesse and elegance. The nose reveals the typical gun-flint scent of the flinty terroir in Pouilly. A great wine. "Alluring, with a lovely swath of tarragon, thyme and savory notes leading off, followed by pure lime zest, gooseberry and fleur de sel accents. Offers a sleek, pure, mouthwatering finish. Drink now through 2021. 2,500 cases made." "As the name suggests, this wine is made using natural yeasts. It comes from a parcel in the small village of Tracy, close to the Loire river. The wine is ripe and full of fruit, with a tangy, orange-zest aftertaste. Drink now." "This is extremely flinty on the nose with undertones of gun powder. Aromas of lemon rind, too. Medium- to full-bodied, round and layered with pretty sliced green apples and a melon character. Drink now." "This is creamy and caressing with warm stone, paraffin, brioche, lemon curd and straw flavors that are nicely integrated. A lovely mouthfeel lingers through the finish."